After the evacuation of Gallipoli in December 1915 the New Zealand forces were returned to Egypt to recover and be reinforced from new drafts from home. In February 1916 it was decided that Australian and New Zealand infantry divisions would be required for the Western Front. Given their experience they had an advantage on the British New Army Divisions appearing on the front lines. The New Zealand Mounted Rifle Brigade was reunited with its horses. It joined the ANZAC Mounted Division alongside the Australian Light Horse Regiments and fought in the desert and through Palestine until the Armistice in October 1918. The Otago Mounted Rifles was detached and sent to France as Divisional cavalry, it would not serve alongside the Division. It would act as a formation used by a Corps of the British Expeditionary Force. Alongside the formation of the fighting Division a whole infrastructure to support the Division was established in England consisted of camps [Sling Camp on Salisbury Plain being the most famous], training centres, hospitals and headquarters. By April 1916 the New Zealand Division [NZDiv] was formed. It consisted of three brigades of four battalions each with supporting artillery and ancillary units. The battalions were organised on regional lines consisted of the Auckland, Wellington, Canterbury and Otago Infantry regiments. The 3rd Brigade was known as the Rifle Brigade and consisted of four rifle battalions. The Maori troops that had fought on Gallipoli were reorganised into a Maori Pioneer Battalion and would not fight as a formation on the Western Front. Pacific Islanders serving with the battalion were left in Egypt as it was felt that they could not withstand the European winters. 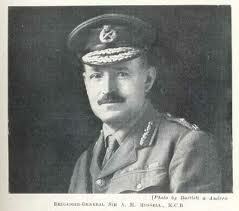 The Commanding Officer appointed was Major General Sir Andrew Russell. He has forged his reputation on Gallipoli leading the Mounted Rifles. He was the only commanding officer the Division had at some cost to his health. He was a stern disciplinarian but a successful battle commander and it was under his leadership that the Division gained a reputation as one of the most reliable and successful attacking divisions with a high standard of training. In May 1916 the Division was given an initial introduction to the Western Front at the trench nursery at Armentières. The NZDiv moved southwards in September 1916 to the Somme. On 15 September 1916 the Division attacked at Flers-Gueudecourt. This was unique as it was the first time that tanks had been used in action. Three tanks supported the New Zealanders attack but failed to reach the German lines. The New Zealanders assisted in the capture of Flers. A second attack in the area followed on 22-25 September. The last of the NZDiv artillery withdrew at the beginning of October as the division was sent to rest and reform. Over 5,000 men were killed during the fighting, almost double the total lost on Gallipoli. This was the end of the all-volunteer force as New Zealand [unlike our ANZAC brethren] passed the conscription law and conscripts began to arrive in France. The next major battle was the attack on Messines Ridge in June 1917. The NZDiv was given the objective of Messines village and it was successfully captured and held. A further 5,000 men were killed. The Division was sent to hold the line at the beginning of the Passchendaele Campaign. The NZDiv did not make its appearance until October 1917. On 4 October the Division staged a very successful attack in the terrible conditions and captured their objectives. On 12 October a further attack was attempted. With limited artillery support and uncut wire, this was a complete disaster. On this day, the highest number of Zealanders killed in one battle was recorded. Over 800 men were lost. The months following the attack at Passchendaele were the worst that the NZDiv experienced on the Western Front, unassisted by the stresses of reorganisation to a four brigade structure. The men fought at Polderhoek from December 1917 to February 1918. This was also the time that the ANZAC cord was broken as the Australian Divisions formed their own Corps ending the II ANZAC Corps which was redesignated XXII Corps. With the German Spring offensive in March 1918 the NZDiv was called upon to stem the tide. What it did is testament to the strength of the men and leadership. Alongside Australians the New Zealanders held their lines and pushed back against the German forces. By August 1918 the Division was part of the 100 Day's Campaign. In September the Division found itself attacking over the old Somme battlefield. During the month it recaptured the town of Bapaume as the Hindenburg Line was broken by the Allied forces. By November the Division was nearing the Foret Mormal. On 4 November the NZDiv staged one of the most audacious attacks on the Western Front. Using ladders, the New Zealanders stormed the moat and walls of Le Quesnoy and successfully captured the fortified town. This was the last operation the Division took part in. On Armistice Day the Division was at rest. The NZDiv was transferred to the 4th Army and took part in the occupation of the western part of Germany. After an easy march through France, Belgium and Germany the division arrived at Cologne. It remained there until March 1919 when the last of the units were returned to England for demobilisation and repatriation home. Interestingly, the BEF high command, in deference to German feelings, refused to let the Maori Pioneers enter Germany and returned the formation to England. By April 1919, three years after its formation, the NZDiv was disbanded. It left behind a reputation as an excellent and reliable offensive division with high standards of leadership. This reputation came at a cost and the majority of those killed in action during the war fell on the Western Front serving with the Division. By November 1918 it was one of the few Divisions of the BEF that remained at full strength throughout its life due to the efficient pipeline of reinforcements that were despatched from New Zealand which by the Armistice equalled 84,000 men sent in 42 drafts. The quality of the division was due to its leadership and the men who formed the brigades. It is generally agreed that it is one of the best formations that New Zealand has ever sent to war. Michael Wynd is the Military Historian at the Navy Museum. He maintains the largest collection of naval history and is responsible for carrying out all the research tasks for both the public, government agencies, and the NZDF. As a military historian, his research interests include the First World War, 19th Century Colonial Warfare, New Zealand's naval history, The Royal Navy in New Zealand, and the Revolution in Military Affairs. He has completed a Master's degree on the Demobilisation of the 1st New Zealand Expeditionary Force and is working on a Doctorate on the New Zealand Division on the Western Front 1916-1918.